Lock in a great price for Hostal Arriazu – rated 8.7 by recent guests! The receptionist was very helpful, positive, and warm. The room was good size. Lots of hot water and towels. The room was well appointed and very clean. The staff were very helpful and informative. 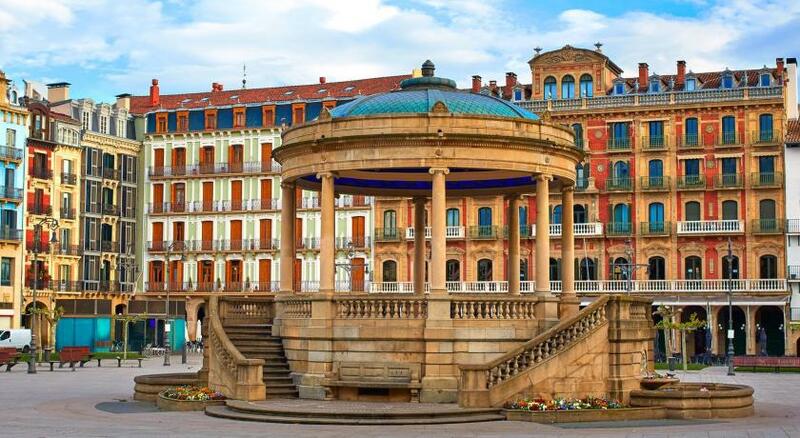 The location of the hotel was ideal for our needs and for seeing the sights of Pamplona. Overall we would highly recommend this hotel. Central location in the historical district. Walking distances to most of the historical attraction attractions. Bars, cafes, mercado, pharmacies near by. Some decent shops too. Room is set up very nicely. Quiet area. Black out curtains. Comfortable beds. Decent shower stall. Coffee machine (1 Euro) and microwave in common area. It was great for us as we began walking the Camino the next day. Front desk gal was very attentive and help us with all our needs. 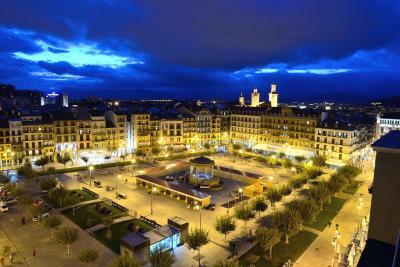 Clean and modern, in the perfect location,Just the center of Pamplona!! Awesome in every way possible! The lady at the reception was so incredible sweet and helpful!!! I can’t remember her name now but she went above and beyond. Accommodates exceeded my expectation. I had a double room with private bath and it was a glorious nights rest. Even on a bus street the noise did not penetrate the windows. Great location and newly remodeled. Good beds, good plumbing. Hostal Arriazu This rating is a reflection of how the property compares to the industry standard when it comes to price, facilities and services available. It's based on a self-evaluation by the property. Use this rating to help choose your stay! One of our best sellers in Pamplona! 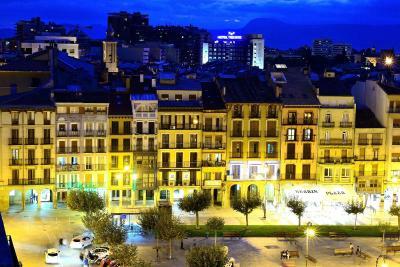 Featuring free Wi-Fi access, Hostal Arriazu is set in the center of Pamplona's old town. The small hotel is located only 150 feet from Plaza del Castillo Square. The Hostal Arriazu offers classic décor with wooden furnishings and floors. Its soundproofed rooms have a TV and a private bathroom. Some of them feature a balcony. 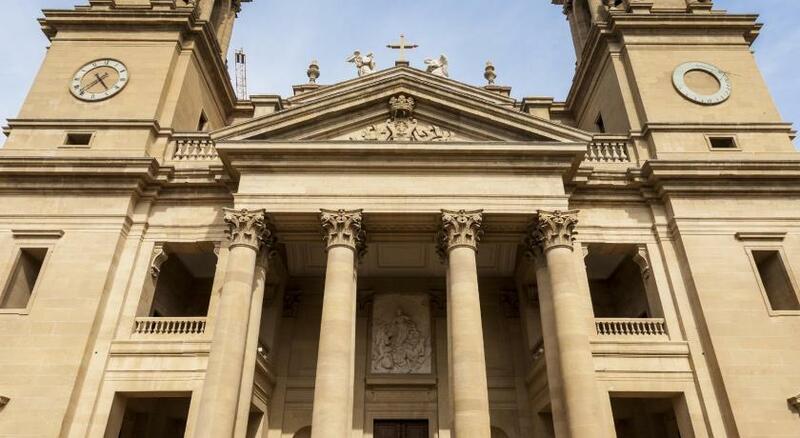 The hotel has easy access to many of Pamplona's sights, including the cathedral, which is just 10 minutes' walk away. The Ciudadella Park and Fortress is less than 1,300 feet from the hotel. There are a wide variety of restaurants within 5 minutes’ walk of the Arriazu. Plaza Castillo offers a range of cafés and bars. When would you like to stay at Hostal Arriazu? Offering free Wi-Fi, this room has a TV and a private bathroom with free toiletries. Some rooms feature a balcony. Offering free Wi-Fi, this larger room has a TV and a seating area. The private bathroom comes with free toiletries. Some rooms feature a balcony. Offering free Wi-Fi, this larger room has 3 beds, and TV. The private bathroom comes with free toiletries. Some rooms feature a balcony. Offering free Wi-Fi, this room has a TV and a private bathroom with free toiletries. It includes a parking place in the room rate. Some rooms feature a balcony. House Rules Hostal Arriazu takes special requests – add in the next step! Hostal Arriazu accepts these cards and reserves the right to temporarily hold an amount prior to arrival. Parking is available at Plaza del Castillo Public Parking. Guests need to hand in the parking ticket at the reception to receive in exchange a magnetic card to access the parking when needed. The parking fee must be paid in the hotel. 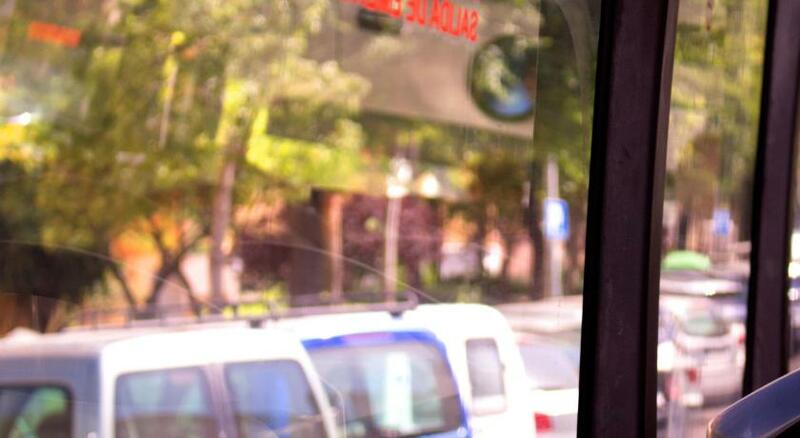 Please note that parking service will not be available during San Fermin Holidays, from 5 to 14 July. Please note that the reception is open until 22:00. If you plan to arrive after this time, please contact the property in advance to receive instructions on how to access the hostal. Friendly girl at the desk. We arrived in pouring rain at night to start walking part of the camino next day. She was very helpful explaining how our bags would be collected by the bag transfer company we'd booked, even though the desk isn't manned all day. The room was gorgeous clean and comfortable. Beds very comfy. Have stayed before and fond it extremely clean and friendly. It's a good break to stay there between Benidorm and France. It was very noisy....couldn't sleep as the walls were paper thin. No English Tv channels. We got this hotel through Booking.com. We really wanted a room with a single double bed however got a room with two twin beds even though I had sent an email directly to the hotel with our request for one double bed. This was a continuous problem throughout our three months of travel in Spain. I think the problem is shared through the booking agencies and the hotels. Neither give you the option to choose your bed type when booking and so it is a guessing game when you arrive. I really dislike twin beds and should be offered the choice. Hotels generally would not give us a double bed when we arrived saying none were available. Great location just off Plaza Castillo and Calle San Nicolas. Bustling street with busy bars. However, the room was facing the street but we had no noise at all from the street below. Extremely clean and looks like it has had a refurb recently. The staff on reception couldn't be more helpful and arranged a taxi for us to take us to the airport. Cleanliness and comfort brilliant. Have stayed before. Really enjoyed Pamplona. The room was clean, spacious and comfortable. The receptionist was very helpful. There's t kitchen atleast to make a tea or microwave to warm food. Location, value, cleanliness were great. The receptionist was really cheerful and helpful. Location, rate, helpful desk clerk, nice beds. Nothing really. As always though, every bathroom we have used in different locations, never have enough shelves to put our own toiletries etc. That is the only problem if you like. The rooms were bigger than expected. Extremely clean and comfy. The receptionist was very helpful and the location was excellent.